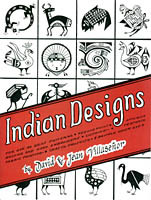 Indian Designs features a collection of Native American designs which are intended primarily for use by silversmiths, but which are adaptable to may other arts and crafts. Featured are numerous geometric motifs and designs as well as design incorporating traditional Indian renderings of birds, turtles, lizards, corn, fish, waves, tracks and paw prints, bison, deer, sheep, spiders and dragonflies, Kachina and sun symbols, snakes, bear, and more. These designs may be traced, photocopied, enlarged, reduced or cut directly from the book. Soft cover, 8.5" x 11", 64 pages. Indian Designs presents authentic Southwestern Indian designs and motifs such as rain birds, turtles, ceremonial figures, dear, quail, thunderbirds, water birds, Kachinas, dragonflies, flute players, sun symbols, fish, grasshoppers, goats, parrots, rams, lizards, snakes, bison, and bear. These designs are adaptations from the rich fabric of Indian designs of the Greater Southwest which have been taken out of context from pottery, basketry, and ceremonials. They are suitable for incorporation in jewelry, quilts and stitchery, beadwork, painting, crafts projects and multiple other uses. Soft cover, 8.5" x 11", 49 pages. From petroglyphs to modern Native American art, decorative designs have played an important role in expressing the ideas and beliefs of those who have made the American Southwest their home for thousands of years. The prehistoric Hohokam and Mimbres people used design motifs in rock art and pottery while the present day Hopi and Navajo use them in arts and crafts today. Although many of the symbols and patterns found on pottery, basketry, rugs and jewelry have histories and meanings assigned to them, many do not. 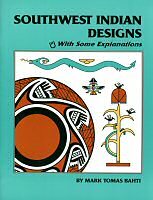 Southwest Indian Designs is an attempt to answer some of the more commonly asked questions and to provide valuable insight into those designs that do not have specific meanings. Included are symbols and explanations of Zuni, Navajo, Hopi, Tewa, Acoma, Mimbres and Hohokam designs. The author has recreated close to 200 symbols and their variations making this an invaluable guide to those interested in the art, history and culture of the Indians of the southwest. 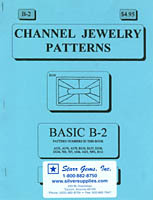 Channel Jewelry Patterns Basic B-2 contains simpler channel patterns suitable for beginning channel jewelry makers and smaller pieces of jewelry. Included in this volume are 13 patterns including a geometric buckle, three abstract pendants, two owls, abstract earrings, a four leaf clover, a Mexican figure, a butterfly on mushroom, a duck, a musical note, and an abstract bola slide. Soft cover, 8.5" x 11", 4 pages. 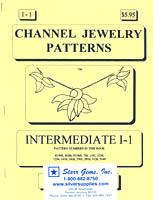 Channel Jewelry Patterns Intermediate I-1 contains simpler channel patterns suitable for intermediate to advanced channel jewelry makers and medium to larger size pieces of jewelry. Included in this volume are 13 patterns including a floral necklace, a peacock, a rose bud, a bird, a cat, a geometric bola slide and cord tips, a rose, an owl, bird earrings, a thunderbird, a stag, and an eagle. Soft cover, 8.5" x 11", 4 pages. 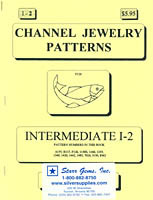 Channel Jewelry Patterns Intermediate I-2 contains channel patterns suitable for intermediate to advanced channel jewelry makers and medium to larger size pieces of jewelry. 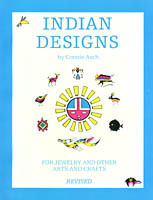 Included in this volume are 13 patterns including a trout, a thunderbird, a geometric belt buckle, a hummingbird, a cardinal, a quail, a roadrunner, an owl, a parrot, an abstact pendant, a peakcock, a rose, and a kachina. Soft cover, 8.5" x 11", 4 pages. 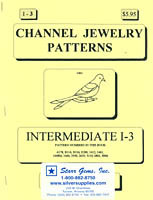 Channel Jewelry Patterns Intermediate I-3 contains channel patterns suitable for intermediate to advanced channel jewelry makers and medium to larger size pieces of jewelry. Included in this volume are 13 patterns including two birds, a ram, a parrot, a rose, an elephant, an Indian, an abstract necklace, two abstract belt buckles, a panda, a swan, and a thunderbird. Soft cover, 8.5" x 11", 4 pages. 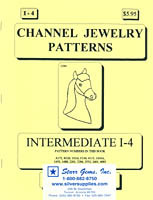 Channel Jewelry Patterns Intermediate I-4 contains channel patterns suitable for intermediate to advanced channel jewelry makers and medium to larger size pieces of jewelry. Included in this volume are 13 patterns including two horses, an abstract pendant, owl earrings, a ram, a goldfish, a hummingbird, a squirrel, a sea horse pin, a geometric buckle, a duck, a pair of love birds and a dog.. Soft cover, 8.5" x 11", 4 pages.